By engaging Ludwick & Shirman, our clients will have access to an experienced team devoted to working on all aspects of their financial plan rather than on individual pieces in isolation. Our clients meet with both principals to design, implement and review their plan and investment portfolio. We believe that two heads are better than one, and our clients appreciate getting more than one perspective on their financial situation. At Ludwick & Shirman, we have designed our own unique financial planning program to address clients’ retirement planning concerns. “Your Life on a Page™” is a financial model that allows our clients to easily see a cash flow projection for the rest of their lives. It helps simplify and clarify their financial situation. It is a dynamic tool that can continuously be used to make critical financial decisions in daily life throughout your lifetime. Unlike canned software programs that often overwhelm people with up to 80 pages, our approach is comprehensive and yet easy to understand. 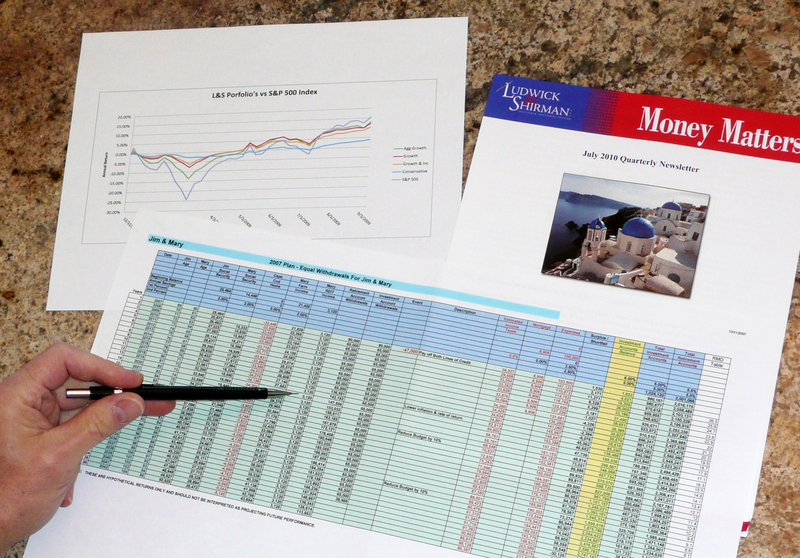 “Your Life on a Page™” is a custom plan that is a result of client participation in deciding what variables to use. By changing variables such as savings accounts, retirement age, investment returns, and expense assumptions, we run several “what if” scenarios that show clients the impact of different decisions on their financial plan. The results are believable because the clients participate in the process and help choose the variables. It puts clients in control of their financial future. What standard of living can I afford after I retire? Will my money last as long as I will? What rate of return do I need to get on my portfolio? Are my investments performing as well as they should be? How much should I save for college and where should I invest it? How much life insurance do I need and for how long? Do I need disability insurance and how much? Do I need long term care insurance and with what terms? What retirement option should I take (single or joint & survivor)? Should I take the early retirement and/or the buy-out offer by my employer? When can I sell my business and for how much? What terms should I get when I sell my business? For estate planning purposes, how should my assets be owned?